Part of the busywork of being an author-about-to-launch is writing essays for book blogs about a variety of things. This weekend I received a request to write about either a) something I’m reading right now, or b) who I’d envision in the movie version of my book. Since b isn’t even something I can wrap my mind around, I wrote this, and wanted to share it since I’m often asked to recommend books. I’m reading WILD by Cheryl Strayed and every night my heart is like a crime scene. The memoir recounts a journey in Strayed’s mid 20s when, after her mother died and her marriage disintegrated, she went hiking the Pacific Crest Trail alone for three months. The goal was to reawaken her soul, which for a long time she’d numbed with all the unhealthy substitutes we find for love. Though the expedition was made out of desperation, it wasn’t carried through that way. Yes, she was physically unprepared and poorly packed — the things she carried in Monster (her massive backpack) would have brought a team of oxen to their knees. Poorly fitting boots made her toenails turn black and fall off. But there’s calm wisdom in her raw unsentimental drive to conquer the trail. It’s as if a remote corner of her unanaesthetized brain was sending out morse code and she had no choice but to listen: You must do something. You must do something to save yourself. This is living like you have nothing to lose, only to gain. It’s not about courage, though of course there’s that, so much as it’s about necessity. And to look at the beautiful place Strayed has arrived in her life — marriage, child, and writing that makes me weep — is testament to the importance of listening to the morse code. It also speaks to the interpretive power of journals over time; she relied upon hers to create this memoir, decades after the trip. This speaks to me too because found journals are a centerpiece of my novel. Appreciating the level of Strayed’s detail here, brought up from notes and memory so many years later, requires a reader to believe in the strength of a person’s need to document and examine their lives as they’re living it. It might be a difficult leap for someone who has trouble imagining doing this. But not for me. I’m so happy to read this! I’ve been fascinated by this book since I first heard about it, and your description reminded me to order it on amazon, thank you! 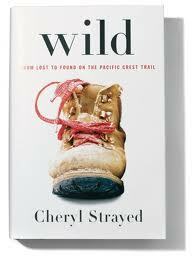 I read “Wild” before it became an Oprah pick and I can understand it’s getting such acclaim. For some reason, I have always been drawn to books about people who walk; the Pacific Coast Trail, the Appalachian Trail, across America for a cause, through the Grand Canyon just for the heck of it, it doesn’t matter. I fancy myself one day donning my own pair of hiking boots and strapping on my own “monster” and hitting the trails. But then I remember that I enjoy indoor plumbing and I don’t care for bugs so I’m content to just read others adventures. Loved, loved, loved this book. There was so much in it that resonated for me. I’m a hiker, and I feel at my most “present” when I’m walking in the woods. Her walk is substantially longer than anything I’ve ever done, but the life she was living in her 20s felt familiar, too. I’ve been recommending this book to all my friends. Read Wild and thought it was a wonderful book about self -discovery and courage.